Size: Manual measurement has been used, there may be some reasonable error. 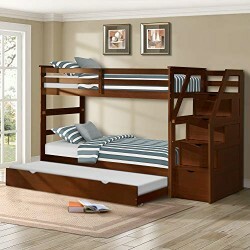 Solid stairs make accessing the top bunk safe and easy, especially for kids too little to climb ladders, while the top bed rail provides extra security and stability. Feature a pullout trundle bed with smoothly removable casters offering extra room for overnight guests and 4 drawers offering large storage space.